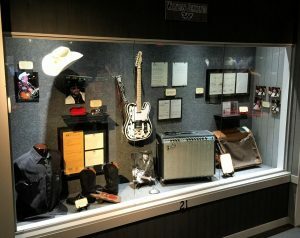 Waylon Jennings Exhibit – Now on Display! We’re very proud to offer so many great Waylon Jennings personal items for visitors to enjoy. The exhibit has been a couple of years in the making to ensure we were able to assemble just the right memorabilia for everyone to enjoy. Waylon Jennings was a great musician who leaves a huge legacy in the music industry. It’s tough to capture all of that in a single exhibit but we have tried. We think you will really enjoy it. The actual passport Waylon Arnold Jennings used while touring the world as part of the supergroup the “Highwaymen”. It is posted with the stamps from many countries including Canada, Singapore, New Zealand, Thailand and Australia just to name a few. There’s also a very well worn piece of Louis Vuitton luggage Waylon used during those travels with his “Road, Inc.” business card still attached. There’s a great story about that luggage and how it was almost lost in Paris, France to former Secretary of State Henry Kissinger. I’m sure you’ve seen many photos of Waylon Jennings wearing his favorite pair of Porsche design sunglasses. Well, we have the actual pair of sunglasses along with the case and extra attachable darker lenses. There’s even a great close-up photo of Waylon wearing the glasses when he came to Nashville for “Ben Dorcy Day” at the Ernest Tubb Record Shop. Ben Dorcy, for those who don’t know, is known as the world’s oldest roadie…more about him later. When Waylon Jennings got an inspiration for a new song he would just grab a pen and paper and start writing. We have several great examples of his handwritten song lyrics so you can see firsthand how the hits were born. You’ll see the white Bailey western hat worn by the late Grand Ole Opry legend Little Jimmy Dickens. Little Jimmy autographed the hat and gave it to his great friends Waylon and Jessie. They were also neighbors at one time when Waylon and Jessie lived in nearby Brentwood, TN. There’s a whole lot more to see but you’ll have to come to Nashville to really experience it. We look forward to seeing you real soon. if you would like to read more about Waylon Jennings then visit our page about him located here.